What does a starry night looks like in your mind? In this land guarded by Angels, when it is in peace and prosperity, Angels once had a grand meeting in a starry night in summer, for it was predicted that peace would be broken very soon. All Angels were ready to fight the coming war, but no one would know how fierce and horrible the war will be. 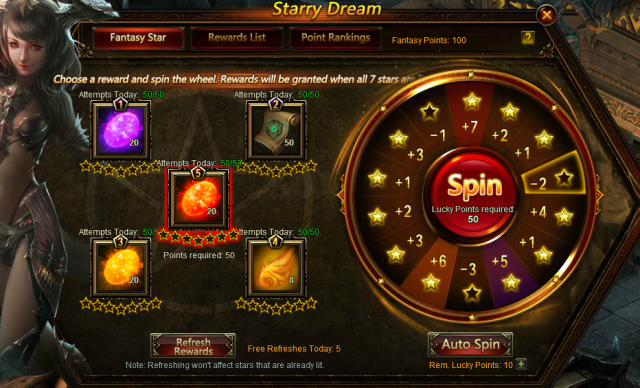 To save more magic resources for Angels and Heroes, they jointly made a wheel called Starry Dream in case the war will be much tougher than predicted. 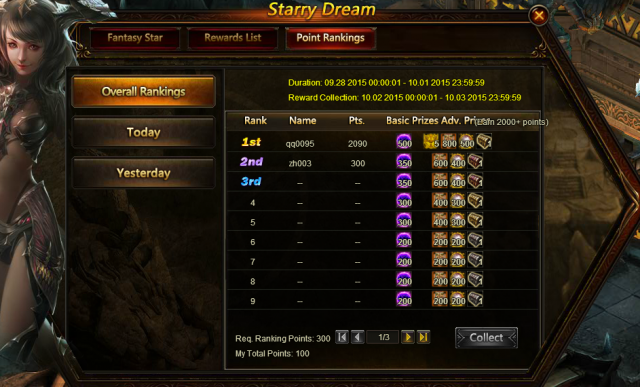 Now, it\'s time for the Starry Dream to appear! It\'s up to you to choose what rewards you would like to get! In this tab you can see five kinds of rewards on the left. These rewards are of different levels. The higher the level is, the better the reward is. There is a star wheel at the right. You need to consume Lucky Points to spin for stars. Please note that higher level reward requires more Lucky Points. 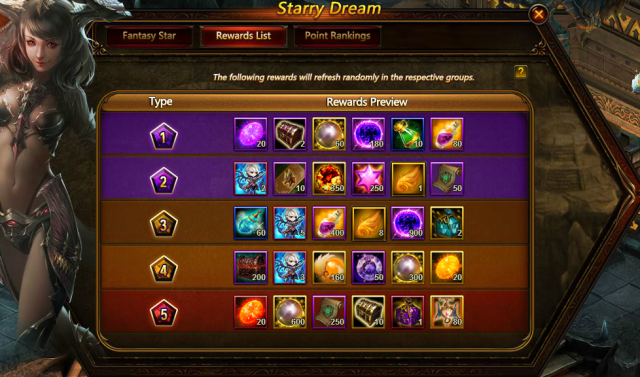 Reward list helps you to know what are available in each reward level. You can click Refresh Rewards button to change the reward. Every player has 5 free attempts to refresh rewards. After using up all the free attempts, you can consume vouchers to get extra refresh attempts. Refreshing won\'t affect stars that are already lit. 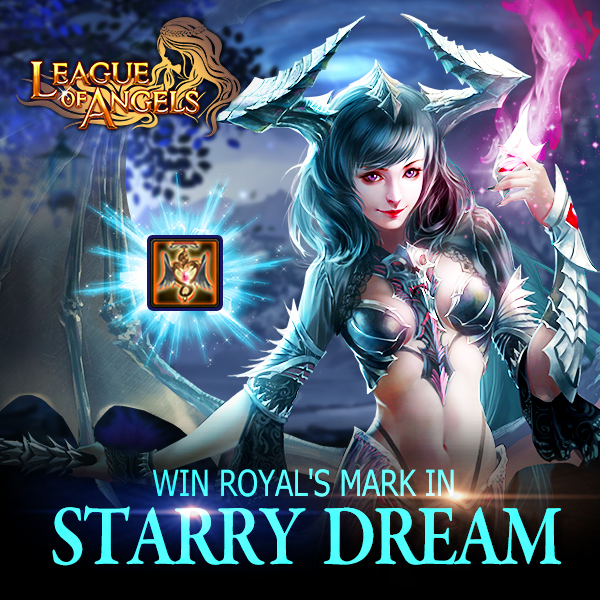 This time Starry Dream brings you powerful angel\'s artifact , Sliver Lord, Royal\'s Mark, Lilac Stone, Element Scroll ,Spring of Wisdom, Lvl. 8 Fusion Gem Chest, Dragonsoul EXP Pack(100), Ungodly Soul, Energy Vitamin and many other items. We will have Yesterday\'s Ranking, Today\'s Ranking, and Overall Ranking. In each ranking, there are basic prizes and Adv. prizes. useless event till they increase the cap for voucher... 10 a day? ;might not even be enough with cheapest item. waste of time until you raise voucher cap! 2019-4-21 14:53 GMT+8 , Processed in 0.066550 second(s), 52 queries .